Contribute to our Two Peds Mother’s Day post! 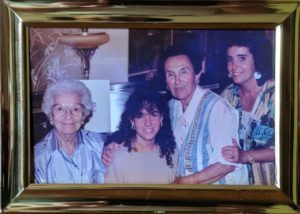 Dr. Kardos, on a visit home from medical school, with her mom and grandmothers, 1991. A flash of surprise spread across her face. “You mean my mother was right? I can’t believe it!” the mom in our office exclaimed. Many times as we dispense pediatric advice, the parent in our office realizes that their own mother had already offered the same suggestions. This Mother’s Day, we’re asking readers for anecdotes about times where maybe, just maybe, your mom or your grandmother was right after all. If you have a photo available of your mom or grandmother with your child that you don’t mind sharing as well, we would love to post them along with your anecdotes this Mother’s Day. Please send them along to us at twopedsinapod@gmail.com before Mother’s Day weekend.